Geologists generally know the age of a rock by determining the age of the group of rocks, or formation, that it is found in. The age of formations is marked on a geologic calendar known as the geologic time scale. Development of the geologic time scale and dating of formations and rocks relies upon two fundamentally different ways of telling time: relative and absolute. Relative dating places events or rocks in their chronologic sequence or order of occurrence. Absolute dating places events or rocks at a specific time. If a geologist claims to be younger than his or her co-worker, that is a relative age. If a geologist claims to be 45 years old, that is an absolute age. Superposition: The most basic concept used in relative dating is the law of superposition. Simply stated, each bed in a sequence of sedimentary rocks (or layered volcanic rocks) is younger than the bed below it and older than the bed above it. This law follows two basic assumptions: (1) the beds were originally deposited near horizontal, and (2) the beds were not overturned after their deposition. Faunal Succession: Similar to the law of superposition is the law of faunal succession, which states that groups of fossil animals and plants occur throughout the geologic record in a distinct and identifiable order. 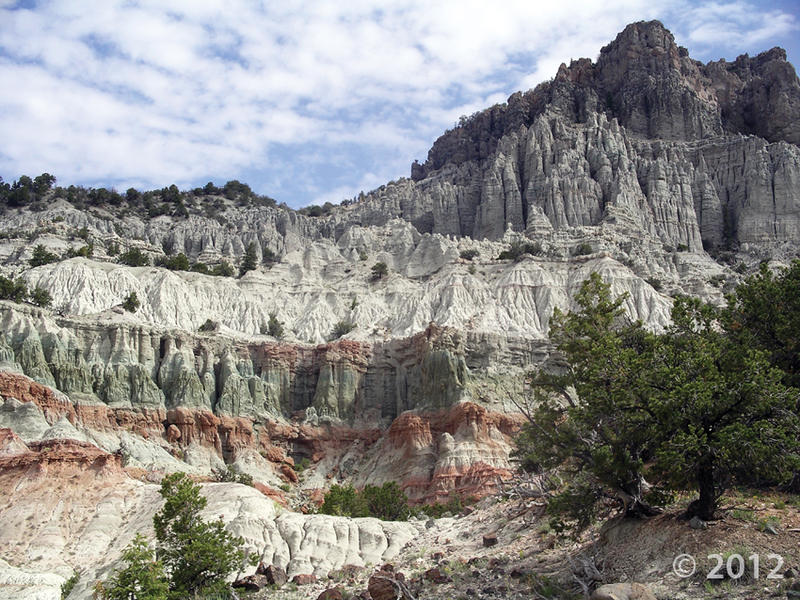 Following this law, sedimentary rocks can be “dated” by their characteristic fossil content. Particularly useful are index fossils, geographically widespread fossils that evolved rapidly through time. Crosscutting Relationships: Relative ages of rocks and events may also be determined using the law of crosscutting relationships, which states that geologic features such as igneous intrusions or faults are younger than the units they cut across. Inclusions: Inclusions, which are fragments of older rock within a younger igneous rock or coarse-grained sedimentary rock, also facilitate relative dating. Inclusions are useful at contacts with igneous rock bodies where magma moving upward through the crust has dislodged and engulfed pieces of the older surrounding rock. Gaps in the geologic record, called unconformities, are common where deposition stopped and erosion removed the previously deposited material. Fortunately, distinctive features such as index fossils can aid in matching, or correlating, rocks and formations from several incomplete areas to create a more complete geologic record for relative dating. Relative dating techniques provide geologists abundant evidence of the incredible vastness of geologic time and ancient age of many rocks and formations. However, in order to place absolute dates on the relative time scale, other dating methods must be considered. The nuclear decay of radioactive isotopes is a process that behaves in a clock-like fashion and is thus a useful tool for determining the absolute age of rocks. Radioactive decay is the process by which a “parent” isotope changes into a “daughter” isotope. Rates of radioactive decay are constant and measured in terms of half-life, the time it takes half of a parent isotope to decay into a stable daughter isotope. Some rock-forming minerals contain naturally occurring radioactive isotopes with very long half-lives unaffected by chemical or physical conditions that exist after the rock is formed. Half-lives of these isotopes and the parent-to-daughter ratio in a given rock sample can be measured, then a relatively simple calculation yields the absolute (radiometric) date at which the parent began to decay, i.e., the age of the rock. Of the three basic rock types, igneous rocks are most suited for radiometric dating. Metamorphic rocks may also be radiometrically dated. However, radiometric dating generally yields the age of metamorphism, not the age of the original rock. Most ancient sedimentary rocks cannot be dated radiometrically, but the laws of superposition and crosscutting relationships can be used to place absolute time limits on layers of sedimentary rocks crosscut or bounded by radiometrically dated igneous rocks. Sediments less than about 50,000 years old that contain organic material can be dated based on the radioactive decay of the isotope Carbon 14. For example, shells, wood, and other material found in the shoreline deposits of Utah’s prehistoric Lake Bonneville have yielded absolute dates using this method. These distinct shorelines also make excellent relative dating tools. Many sections of the Wasatch fault disturb or crosscut the Provo shoreline, showing that faulting occurred after the lake dropped below this shoreline which formed about 13,500 years ago. As this example illustrates determining the age of a geologic feature or rock requires the use of both absolute and relative dating techniques.